John Preus, Swingset, 2015, Materials salvaged from recently closed Chicago public schools, 8 ft x 9 ft 5 in x 5 ft 5 inches. For the past decade John Preus’s interdisciplinary art practice has poetically investigated and sparked dialogue about contemporary social-political, civic, and labor structures. 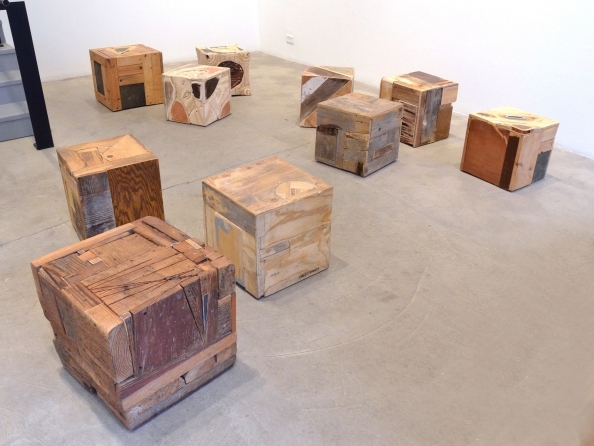 In The Relative Appetite of Hungry Ghosts, his first solo exhibition at Rhona Hoffman Gallery, Preus has developed an installation of sculptural furniture from materials salvaged from the 49 Chicago Public elementary schools that were closed in 2013, a single act that displaced 12,000 children in the city’s south and west neighborhoods. The soft wood in Preus’ bricolage cubes, swing set, and bench reveal graphite scribbles, sticker sediment, carved initials, and red gum: individual traces of student wear. The salvaged desks and chairs, rubble of democratic and civic education, become restored and reassembled into endlessly creative, alluring furniture and sculpture. Preus approaches his materials with a sensitivity, craftsmanship, and concern for artistry that esteems labor and craft. At the same time, his artfully repurposed works reference Surrealist assemblage and Duchamp’s Readymade. The transformative objects in The Relative Appetite of Hungry Ghosts provide hope that artistic ingenuity can revitalize and untangle even the most disheartening political messes. John Preus (b.1971) is a Chicago-based trans-disciplinary artist, designer and furniture-maker, amateur writer and musician. He holds a MFA from the University of Chicago. He founded Dilettante Studios in 2010 and co-founded SHoP with Laura Shaeffer (2011), Material Exchange with Sara Black (2005). Preus has fabricated for artists including Theaster Gates and Dan Peterman. He collaborated with Theaster Gates on the Dorchester Projects and was project lead for 12 Ballads for Huguenot House at Documenta 13. Preus will be the Kaplan resident at Northwestern University in 2016. He was Jackman-Goldwasser resident at the Hyde Park Art Center in the 2013-2014, an Efroymson Fellow in sculpture and installation, first place winner of the Maker grant, a finalist for the 2015 Artadia Award and 2014 Creative Capital grant, and a 2014 DCASE artist grant recipient. Solo exhibitions include the Heilbronn Kunstverein in Germany, The Hyde Park Art Center in Chicago, The Audible Gallery at the Experimental Sound Studio in Chicago, Montserat Art Academy in Beverly, MA, as a founding 2-person collaboration with Material Exchange at The Museum of Contemporary Art, Chicago, Threewalls Chicago, The Museum of Contemporary Craft in Portland, OR, and The Iceberg Gallery in Portland, OR. Group exhibitions include the Museum of Contemporary Art, Chicago, The Elmhurst Biennial, the Hyde Park Art Center, The Huguenot House in Kassel, Germany, and The Devos Art Museum in Michigan.